Livni calls for Israel to stop spending outside settlement blocs. “It won’t stay a part of Israel,” she predicts. 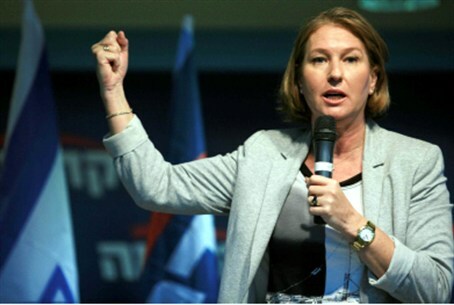 Israel needs to invest in “settlement blocs” but to avoid spending elsewhere in Judea and Samaria, Hatnua (The Movement) party head Tzipi Livni said Tuesday, speaking to students at Ben Gurion University. “Israel doesn’t need to throw away money on sawing homes into pieces and moving them from hilltop to hilltop, or on paving roads in places that won’t be part of Israel under a diplomatic accord,” she declared. Livni, formerly the head of Kadima, criticized the government for approving construction within Maaleh Adumim, which is part of a “settlement bloc.” The world has widely condemned the planned construction, due in part to apparent faulty information. She also slammed the government over the recent Pillar of Defense counter-terror operation. “I supported Cast Lead and Pillar of Defense, but I opposed the way Pillar of Defense ended,” she said. “Israel must restore deterrence against Hamas, but instead the government of Israel began indirect negotiations with it… Hamas came out the victor, and if there were elections today in the West Bank it would apparently win there, too,” she argued. “This is the result of the flawed policy of the administration, which gives fiery speeches, but ultimately gives Hamas what it wanted,” she added. “We need to hit Hamas with our right hand, and conduct negotiations on the left with those it’s possible to reach an agreement with – and it is possible to reach an agreement,” she concluded. Palestinian Authority leaders have refused to negotiation with the current administration unless it agrees to meet several preconditions, including a complete construction freeze east of the 1949 armistice line.